Pope Francis recently made an incredible assertion that, so far, I’ve seen no media stories about in the American media. I think readers of this blog would like to know what he said as it was both disturbing and enlightening. 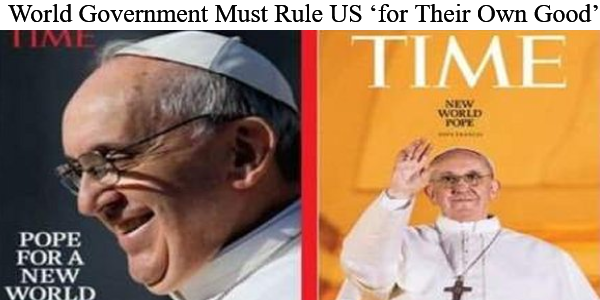 Reportedly, Pope Francis stated that Americans must be put under “global” government as soon as possible “for their own good” (first link). Wow! Is that ever an anti-democratic, autocratic pronouncement. The report also stated that the “radical leftist pontiff” added that “Europe should become one country under one government.” The Pope is clearly showing a strident totalitarian perspective on world events. This puts the pontiff in the same globalist camp as France’s globalist and embattled leader Macron and Germany’s Angela Merkel who recently called for nations to give up their national sovereignties to supranational governments such as the EU (second link). Another media report about the pontiff’s anti-American, globalist comments can be found in the third link. This comment by Pope Francis was so brazenly dictatorial in nature that I checked with snopes.com to see if it was true. That site had no comment on the Pope’s statement one way or the other, so there was no warning that it was an inaccurate report. If all Americans knew about the pope’s attack on American independence and sovereignty, the credibility of the Vatican inside the USA would plummet, in my opinion. Indeed, the Vatican’s call for globalist world government is longstanding. The fourth link shows the Vatican has called for a world government since at least 2011. This is not the first issue which has caused trouble for Pope Francis. The fifth link contains a report about a statement made by Pope Francis that “sin…exists when people disobey their conscience.” That puts the pontiff at odds with the Bible and Christian theology. The Bible plainly states in I John 3:4 that “sin is the transgression of the law [of God].” People’s consciences can be flawed, corrupted or “seared with a hot iron” (I Timothy 4:1-2). Unless a person’s conscience is in harmony with the scriptures of the Bible, their “conscience” is wrong. Indeed, this passage in I Timothy prophesies that especially in the latter days human beings will have consciences that are horribly corrupted, excusing all kinds of sins. We are probably living in the latter days (when this scripture applies), so we are living in a time when many people’s inner “conscience” will be non-functional and unreliable. For Pope Francis to state that people can trust their carnal human “conscience” to determine sin again puts him at odds with the Bible. The Bible is very clear that sin happens when people disobey God. People whose “conscience,” says they can sin against God’s laws and his Word are simply flat-out wrong. Pope Francis has also attacked those who want to build walls to keep migrants out (a clear slap at Trump and the nationalist governments in Europe), but the Vatican itself insists on having fairly substantial walls around its own territory to keep people out (sixth link)–a rather clear case of hypocrisy by a pope who is more a leftist/globalist political advocate than a Christian leader. The pope has also come under fire for a weak response to the widespread scandal of Catholic clerics abusing boys in pedophilia crimes. Even an archbishop within the Catholic Church commented publicly about the Catholic Church’s “homosexual networks” that perpetuate the pedophilia scandals and even called for Pope Francis to resign over this matter (seventh link). The link notes that the Catholic Church is itself increasingly divided internally concerning Pope Francis and that “many conservative Catholics say the pope must go” while Catholic liberals defend him. The eighth link offers an analysis of Pope Francis’ initial popularity and his growing problems within and outside of the Catholic Church. When Pope Francis openly calls for Europe to have a single, globalist government, he actually sets himself firmly against many of the remaining Catholics within Europe. Some of the nationalist/populist governments within Europe (Hungary, Poland, etc.) were elected by people who want to defend their traditional European Christian (i.e. Catholic) culture. Overwhelmingly, these people are conservative Catholics who want to defend traditional European culture against a wave of Islamic immigrants brought indiscriminately into Europe by Merkel, the EU, and the insider globalist power-brokers. Pope Francis, in defending the waves of Islamic immigrants who came into Europe, opposes devout European Catholics and defends non-Christian Muslims (some of whom want to impose Sharia law on native Europeans). After Pope Francis’ outburst vs. the USA and his pro-globalist statements to date, no one should doubt that the current pope’s primary agenda is to advance the agenda of globalist/leftists (who are invariably non-Christians). This should stimulate some serious reflection on the part of all readers about what is happening inside the Catholic Church. Will Pope Francis be deposed by Catholic conservatives or will he be sustained in his position by the leftist/globalists within the church? How this question is answered should interest all students of biblical prophecy. For clear documentation that we are living in the biblical time prophesied in I Timothy 4;1-2, please read my free article, Are We Living in the Biblical Latter Days? My thanks to a reader who tipped me off to this story.